Enderthing provides the ability to have globally-shared color-coded inventories. Yes, it's quite similar to Ender Storage. No, I'm not trying to replace it. I wrote this mod because at the time it was not updated, and I was bored enough to do it. I still maintain it, because I want to. No new features planned at the moment, but I'm open to suggestions, if they make it more varied and unique (Which means, I won't be adding colored tanks). No promises. If you die in 0.5.4 and earlier, the contents of your private inventories WILL be lost, with no way to recover the data other than a world backup! Please upgrade ASAP, as the new storage system introduced in 0.6 does not have this issue. You can contribute translations at the project's GitHub page. Just clone the repository or use the web editor, it's easy! Ender Key: By shift-rightclicking on an Ender Chest, you can open the shared inventory corresponding to the color code of the key. Anywhere, any time. Private Keys: These items act like the normal keys, but instead of opening a global inventory, the inventory is player-bound instead, which means other players will get separate inventories from you. 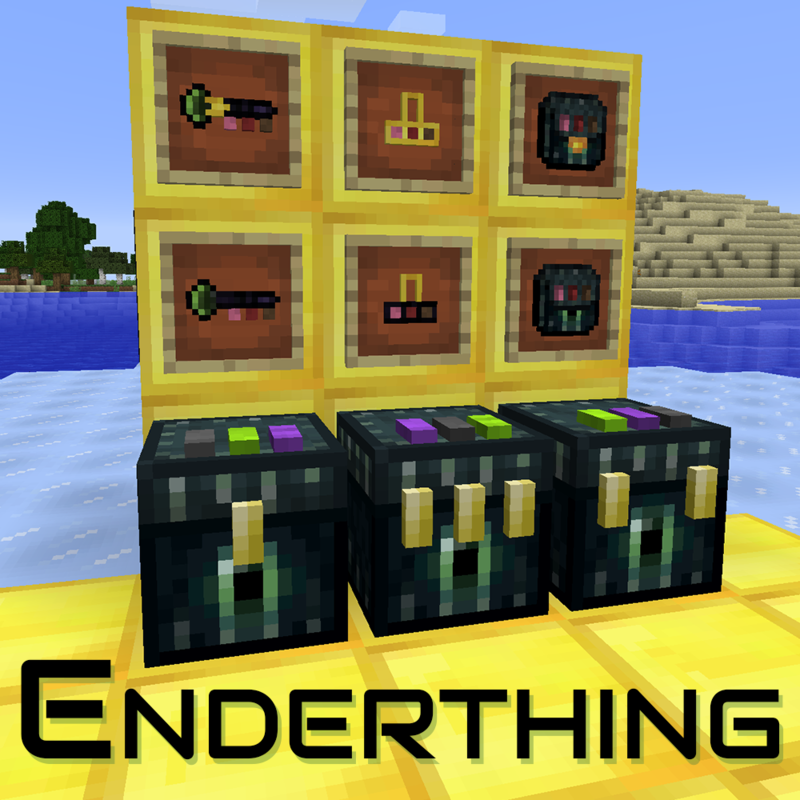 Ender Lock: By shift-rightclicking on an Ender Chest, you can permanently convert this chest into an Ender Key Chest, which will allow hoppers and other pipes to access the chest. If you use the lock on an already-keyed chest, the old lock will pop off, meaning it's reusable. If you want to de-key a chest, put it on your hand, and shift-rightclick on air. Private Locks: Similarly to keys, they act like normal locks, but with a caveat: Private chests can not be automated, since the inventory is bound exclusively to the player. Use Silk Touch to break without losing the Eye, like in vanilla! Clicking the areas around the pieces at the top with dyes will change the colors. Note that this acts on the top face, not the wool pieces themselves. Ender Packs: Same principles as the chests and keys: normal ones access the global network, private ones access the private network. Ender Security Card: Once bound to a player, the card can be used to bind a chest to a player, so that the inventory becomes automatable. Any plans to update to 1.12. I had way too much in my hands back when I made the decision to stop updating this mod. I also didn't think there would be much interest on it given that Ender Storage is still being updated. I have considered continuing it, but I would like to make it overlap a bit less: I really liked the idea of the keys, but since I introduced the locks, I feel that the keys system became forgotten. I might give it some more thought now that I have more free time, but no promises. I don't often comment on mod doing the same thing as Ender Storage (as it's original author), however, this mod comes off as a blatant clone. It feels rather off putting to me, to essentially clone a mod that is still supported. Now, I understand that the reason for the clone was due to Ender Storage not updating for a period of time. However, I feel like people should at least attempt to communicate with the authors of the mods before they just assume they are abandoned. Despite the fact that I am not very active in the modded Minecraft community anymore, I do try to make sure Ender Storage continues to have a developer. I also comment on the GitHub regarding suggested features and/or changes to the mod. So...this whole thing kind of baffles me. Here is a link to the current Ender Storage as well as a link to the GitHub for it. You and chicken bones went missing for months after 1.8 came out right? I see several posts in reddit about it from that time period. Plus, not only did gigaherz clone EnderStorage and put out the 1.8/1.9 versions faster, but he also then kept it up to date, beating EnderStorage to every upgrade after that, until 1.12. Sometimes by 2-3 months. Kudos, gigaherz. I applaud the work put into the Enderthing project. Clones are not a bad thing for the community. Look at NEI/JEI; WAILA/HWYLA; ComputerCraft/Computality; AE2/Refined Storage. I am so glad for all of those. And I'm glad for this project. This is just simple competition. Competition is a good thing for users. There are several other abandoned mods that I wish someone would clone too. Is there a hard limit on the number of private chests a player can have? I'm encountering an issue where I'm unable to craft anymore private chests or locks. I put the recipe in the crafting grid, but when I try to remove the result, it just disappears. The chest has occasionally shown the same thing, but I could usually craft a lock, and from then on craft chests again. Nope, you can craft infinite of them. There's a limit in the wool combinations (16^3=4096), but you can repeat colors and keep crafting more of the same combination just fine. Is there any error in the logs? This makes no sense, so I'll investigate as soon as I can, but the more information I have the better, so I'd appreciate if you can look at the logs and pastebin them. Other things to try may be to try different combinations of wool, maybe some color isn't working or some silly thing like that. I can't make the issue happen. Both 1.10.2 and 1.11 versions work fine so far as I can tell. What other mods do you have installed? It's a large list (if you're interested, and have time, it's the Hyperantix pack on Curse), but I suspect you're on the right track with it being another mod somehow interfering with the crafting process. It's actually an intermittent problem. It happens, and persists through several logins, then all of a sudden, I'm able to craft either a private lock, or a private chest, or both. I've been talking with the mod pack curator, he's managed to replicate the issue on the server too, but on the test server with a newer version of forge he was unable to reproduce it. So it might be a quirky bug with the version of forge we're using compounded by some other weird mod interaction. We're just waiting on a permission from 1 mod to update the pack, after we update, I'll let you know if the problem persists and see if I can get some server log files forwarded to you. Looks as if NoMoreRecipeConflicts was somehow the culprit. Interesting. I'll take a look at that mod and see how it could matter. I'm having a hell of a time seeing the actual chest recipe in JEI. It keeps rotating over and over just showing the colors added to it over and over but can't actually see the base recipe. What do you mean? The recipe is the same, the "rotating colors" is just because it can't know what the output will be until you put the actual wool items on a crafting grid. I assume you would of had a ender chest vanilla to make your version so I checked through the usages of the vanilla ender chest and only your bag showed up oddly enough. Oh I see, yeah there's no recipe to make chests directly, you have to craft a Lock, and then apply it on a vanilla enderchest. Wow, I'm an idiot ;) Thanks! On 0.7.0, the private pouches do not have a texture (but otherwise work just fine). v0.7.1 is up, fixed a typo in the model file. > "Use Silk Touch to break without losing the Eye, like in vanilla!" AKA "I totally ripped off chickenbones, but in order to differentiate my mod I've decided to be a troll and reintroduce the vanilla mechanic so everyone that gets it in a pack and expects it to act the same as Ender Storage loses their eye of ender". >There are already other mods doing Ender Tanks. My approach would have to be different in some way. First of all, I didn't "rip off chickenbones", I created this mod specifically *BECAUSE* Ender Storage wasn't ported at the time, and people were asking for a replacement. I chose the key system as an interesting idea for using the chests, and I added the locks as a way to make it permanent. I did not include tanks because there already were mods doing it at the time. The reason I chose to make the chests break was NOT to annoy people, NOT because I felt the need to be different. I simply chose it because I thought it was a good idea. I see from my notifications that you did first ask nicely, and I WOULD have added a configuration option so the block would always mine as itself rather than break. I like to give everyone the option to play the way they want. I strongly believe in letting people play their own way, even if it's not the way you thought was best. So yes, I WOULD have added it. I would have been all over the task, and I would probably have had a release ready by tonight. I don't know why you felt like you had to delete that comment and then post a rude one, when all it achieved was remove my interest in actually doing it.